Quilting by the Lake (QBL) began in 1981 as a four-day quilting conference in Cazenovia, NY, and has grown into a two-week, internationally recognized quilting event attracting over 200 participants from around the country and overseas. From the beginning, QBL recruited some of the most innovative and legendary quilters to teach and that tradition continues today. Classes are offered in design, techniques and surface design. 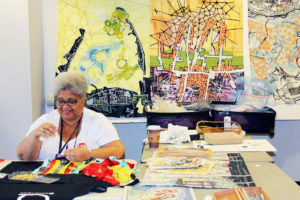 No matter what your style- traditional, art or modern- all quilters are welcome. 2019 Faculty: Betty Busby, Elizabeth Busch, Sarah Bond, Rachel D.K. Clark, Rosalie Dace, Kathy Doughty, David Hornung, Paula Kovarik, Amanda McCavour, and Emily Richardson.